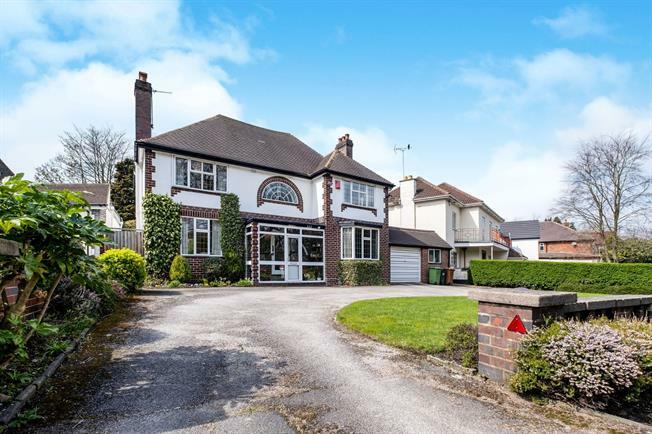 4 Bedroom Detached House For Sale in Sutton Coldfield for Offers in the region of £575,000. An immaculately presented & well maintained family home benefitting from double glazing and gas central heating. The accommodation in brief comprises: entrance hallway with feature stair case, living room, dining room, family room, breakfast kitchen, ground floor shower room, four double bedrooms, family bathroom, full en-suite off master bedroom. Externally the property benefits from an in/out driveway, side double garage and beautiful rear gardens. Internal viewing is highly recommended to fully appreciate the size and condition of accommodation which is offered for sale with no upward chain. Double glazed sliding patio doors, opening onto the garden. Double glazed window facing the front. Radiators and electric fire, ceiling light. Double glazed bay window facing the front. Radiator and electric fire, ceiling light. Double glazed door, opening onto the garden. Double glazed window facing the rear. Radiator, built-in storage cupboard. Roll top work surface, fitted wall, base and drawer units, one and a half bowl sink with drainer, integrated double oven, electric hob, overhead extractor, space for fridge/freezer. Double glazed window to rear, low level WC, pedestal sink, walk in shower, radiator. Electric up and over door to front, pedestrian door to garden, central heating boiler, space and plumbing for washing machine and dryer, light and power points. Double glazed window facing the front and side. Radiator, fitted wardrobes, ceiling light. Loft access . Double glazed windows facing the rear and side. Radiator and heated towel rail. Low level WC, Jacuzzi corner bath, single enclosure shower, vanity unit with inset sink, bidet. Double glazed window facing the rear and side. Radiator, ceiling light. Double glazed feature semi circle window facing the front. Radiator, ceiling light. Double glazed window facing the rear. Radiator. Low level WC, panelled bath, pedestal sink. Patio area, extensive lawn, mature and established tree and shrub borders, fenced surround, access on both sides from front to back.